Joe Urrittas 1941 Ford Sedan was restyled in 1949 by Sam Barris. No panel on the car was left untouched. The end result was a stunning looking Masterpiece. The first time I saw something about the Joe Urritta 1941 Ford was in the August 1991 issue of Street Rodder magazine where Harry Bradley showed this illustration of the original car in his Tribute article. 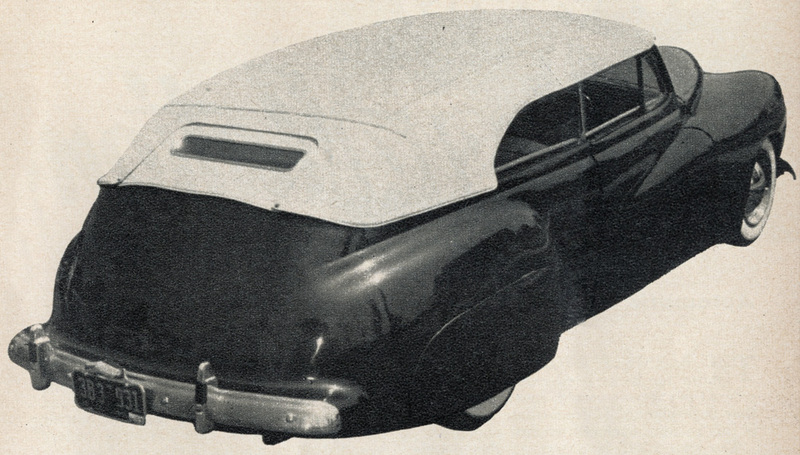 This side profile, and one rear quarter view of the car appeared in the 1951 Trend Book Custom Cars. 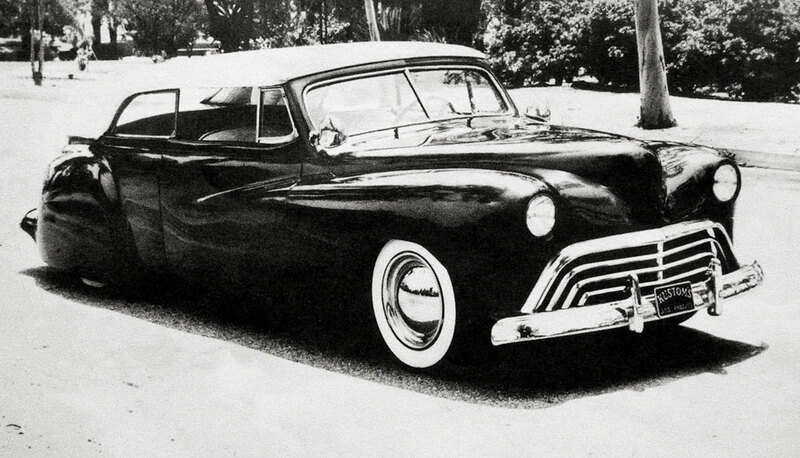 The Joe Urritta Ford was created in 1949, and its amazing that the car was featured as much as it was. 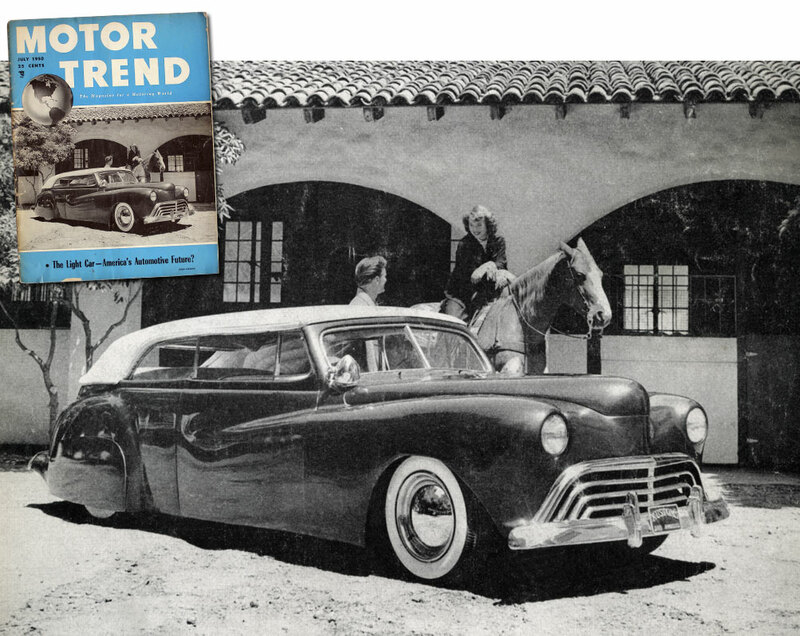 Making the cover of the July 1950 issue of Motor Trend must have been the highlight for the owner, as well as for Sam Barris who created the car. According the stories that have been published about the car we fortunately do quite a bit about this car. Most publication state that the car was created in 1950, but it was actually built in 1949, and can be seen in primer, or unpolished paint at the 1950 National Roadster Show which was held in Oakland California from January 19 to 22. Somewhere in 1949 Joe Urritta drove his 1941 Ford sedan from Frensno, California to the Barris shop in Lynwood, around a 200 mile drive. 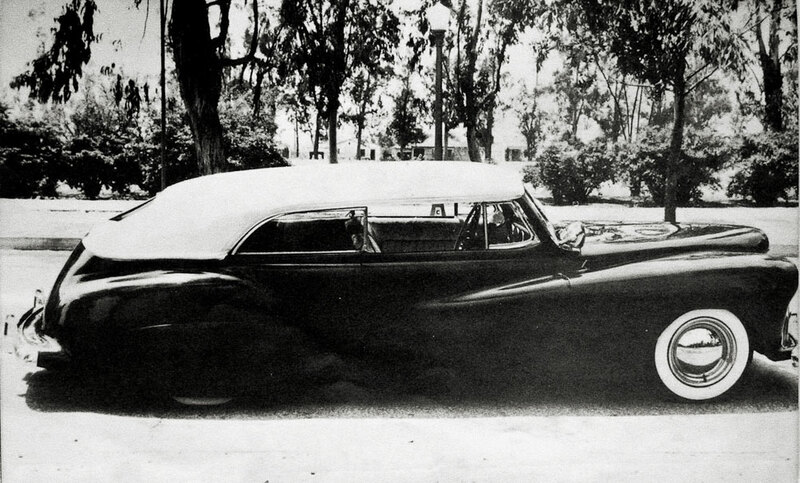 Joe wanted to have his sedan converted to a convertible sedan with padded top, and it needed to be as low as it could get. At the Barris Shop it was decided that this would be Sam’s project and over the next couple of month he would create one of the wildest Customs the shop had ever created. The car has some styling cue’s from the Johnny Zaro 1941 Ford, as in raised fenders, heavily sectioned hood and fade away fenders. Perhaps some ideas were “borrowed” on Joe’s Ford, but everything was done so much different on Joe’s Ford. Joe Urritta’s 1941 Ford was shown for the first time at the 1950 National Roadster Show held in January that year. We do not know for sure if the car was still in primer, or if the Barris shop ran out of time to polish the fresh paint. Perhaps the car was polished at the show after this photo was taken at set-up day? Sam started with cutting off the top completely. The doors were replaced with convertible door, and the top portion of the cowl was replaced with a convertible cowl so that the convertible windshield could be used along with the vent windows. The new belt line had to be reshaped to fit with the convertible doors, and to finish the rear section where the rear of the top used to be. The trunk was welded shut and the whole body was reenforced so that the body could be handled for the next step. Next up was channeling the body over the frame to get the car as low as possible. The floor was cut out, and the body was dropped over the frame until the perfect height was achieved. The rear of the body was dropped more than the front for the desired speed-boat look. New floor attachment point were welded in place at the new height and the floor was welded in the new much higher location. The running boards were removed and the bottom of the body was reshaped. The rear fenders were move up around 5 inches and rotated a bit to flow better with the design of the car. The top of the new fender location is about two inches below the top of the body. A beautiful front 3/4 view of the Joe Urritta’s 1941 Ford appeared on the cover of the July 1950 issue of Motor Trend magazine. This must have been a great feeling for both the car owner Joe, as well as for Sam Barris who build it. Explaining the Motor Trend cover photo on page five. With the main body and rear fenders roughly in position Sam decided the suspension needed to be lowered as well to get the car at the desired ride height. Sam reshaped the front spring added a dropped front axle, raised the rear crossmember, de-arched the rear spring and reversed the spring eyes. With the rear of the body in the right position Sam could move on to the front of the car. The front fenders where lowered from their stock position until the wheel opening fitted nice over the tire. The new location was much higher compared to the body than stock, this meant that the hood no longer would fit, and needed to be sectioned to fit the new fender location. The new much thinner hood now sits about two inches taller than the top of the front fenders. With the front fenders and hood all roughed in, it was time to create the new fade away fenders. 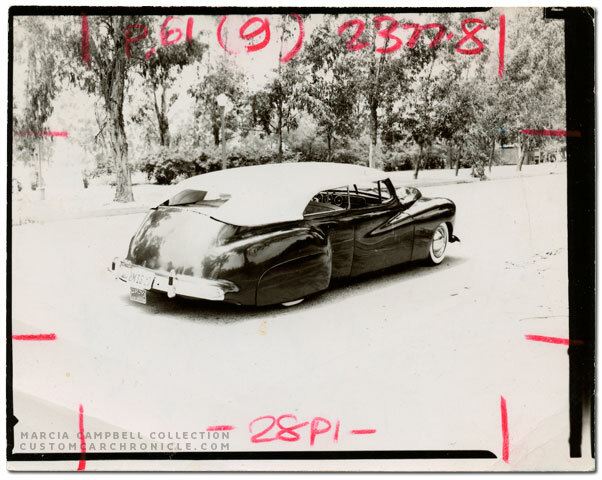 Sam and joe had decided that the car would not have full fade away fenders, but rather shorter units fading into the rear portion of the doors. Sam most likely asked the California Metal Shaping company to create these new panels to save time. 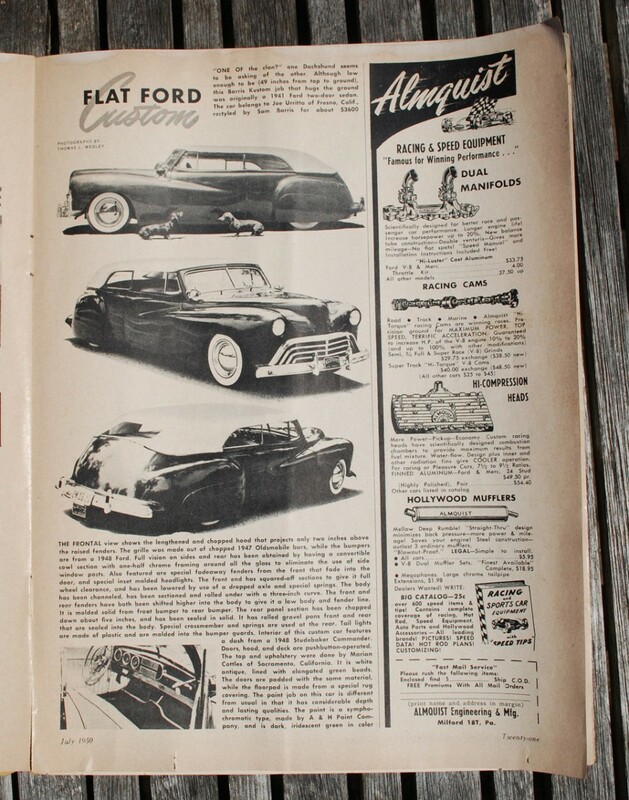 The one page feature article on the car in the July 1950 issue of Motor Trend. The article credits Thomas J. Medley for the photos. However the bottom three were actually taken by Marcia Campbell. Scan of an original photo proof from the Marcia Campbell Collection. This photo was used in the MT article, as well as in the Dan Post Blue Book of Custom Restyling. Cropped scan of the photo-proof. Sadly the photo proof is developed a bit lighter than the actual photo, washing out some of the details. The rear 3/4 view of the Joe Urritta Ford is my personal favorite. Notice the small bumper guard taillights and the Kustoms Los Angeles plaque hanging from the rear bumper. The rear window flap has been removed hence the large opening in the rear of the top. The new fading fenders were tacked in place and next up was the new front end. Sam had put a 1947 Oldmobile grille on top of the molded in front splash pan and reshaped the metal around it to flow with the cut down 1941 Ford front sheet metal. The headlight bezels were frenched to the body. 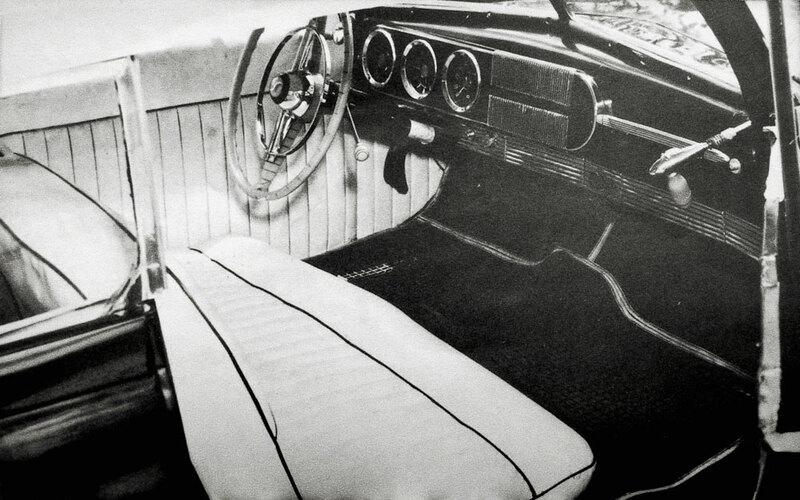 The convertible windshield frame was cut down around 4 inches. With all the body wok roughed in place it was time to clean up things. All the fenders were molded to the body with shaped sheet metal and smoothed plenty of lead for that desirable one piece look. The character lines on all four fenders was welded solid and hammered smooth for an even more smooth look. Sam added a set of long 1941 Ford fender skirts and mounted 1948 Ford bumpers. 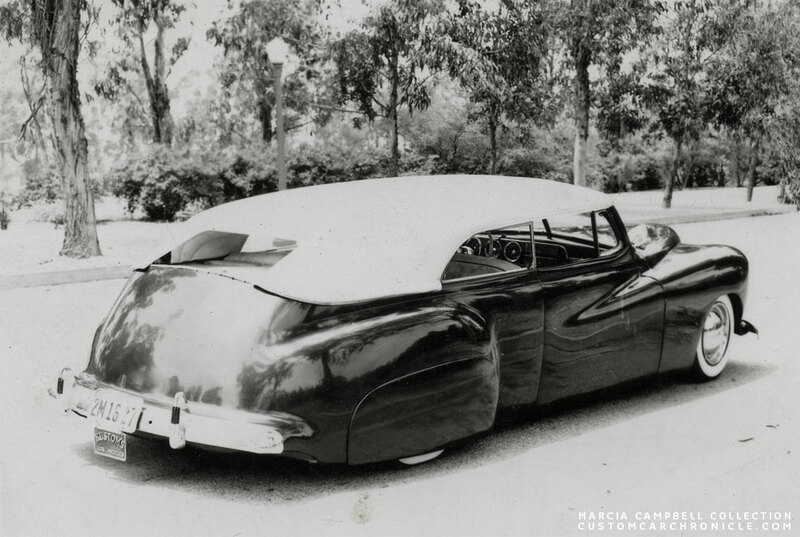 The new body shape Sam had created looked nothing like the once two door sedan body anymore. The new low, long and sleek body looked amazing. The low hood and wonderful slight downwards point fade away fenders optically extended into the 1941 Ford fender skirts. The 1947 Old grille looks right at place in the lower than stock front of the car. I’m not quite sure that is going on with the 1948 Ford front bumper. In most of the photos it appears the ends are slightly twisted down. This front 3/4 view also shows that the chopped windshield appears to be to upright for the overall design of the car. On the other hand, this does give the car a nice early feel. I really like the addition of the 1948 Studebaker Commander dash and steering wheel to the car. Due to the raised floor, which is very evident in this photo, the seats had to be modified a lot. The upholstery was done in Antique white with green piping and dark green carpets created by Marian Cottles from Sacramento. Side view photo by Marcia Campbell shows how long the chopped padded top is and how it flows nicely into the reshaped rear section of the body. 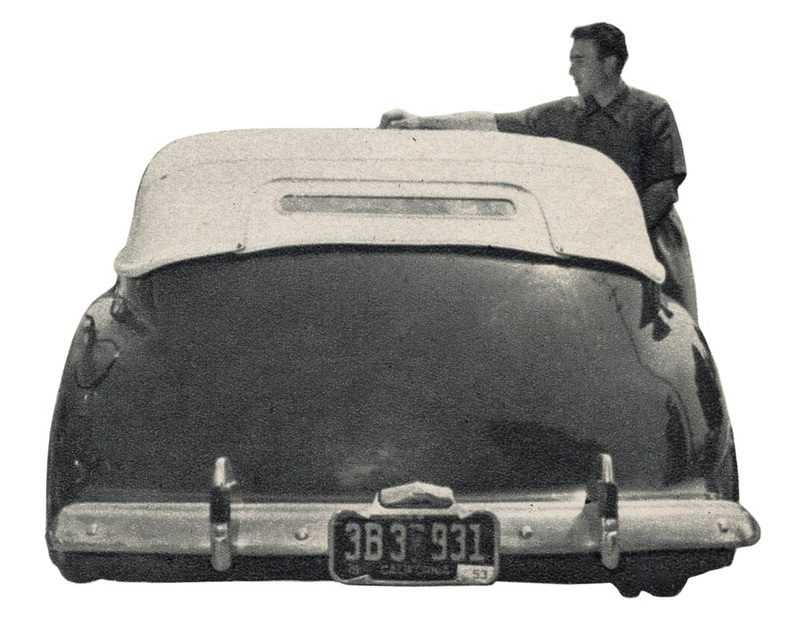 The 1942-48 Ford gravel pan at the rear was mounted higher and the rear bumper was also raised a bit from its stock position. 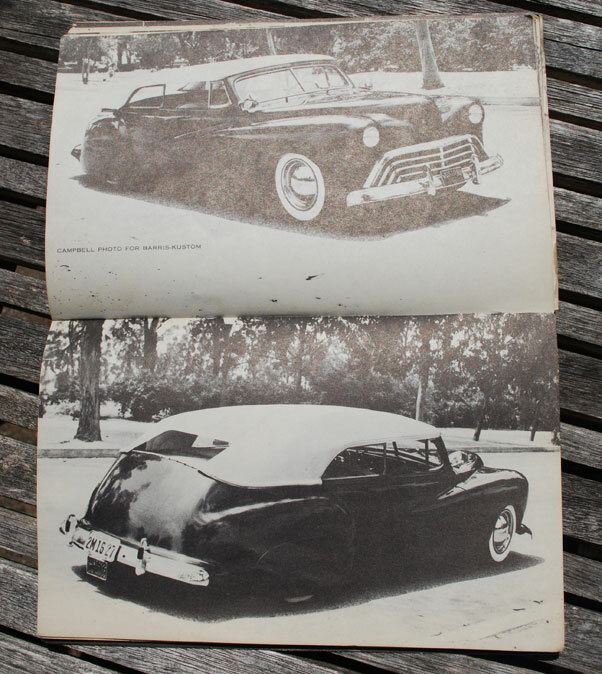 Dan Post used 4 photos of the Joe Urritta 1941 Ford, taken by Marcia Campbell, in the 1951 and 1952 edition of his famous Blue Book of Custom Restyling. The low angle side view photo of the Ford with the two Dashunds is the most famous photos of the car. It show how long, low and extreme the car is, especially considering it was created mostly in 1949. 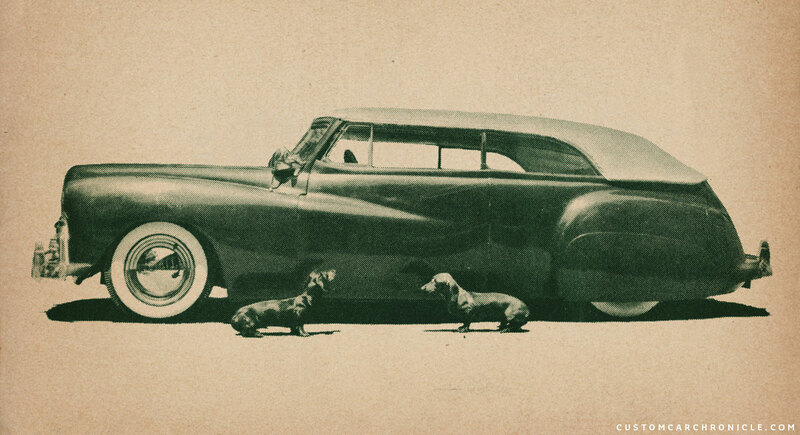 Also interesting to see is the similar profile of the dogs compared to the car… tail-dragging. 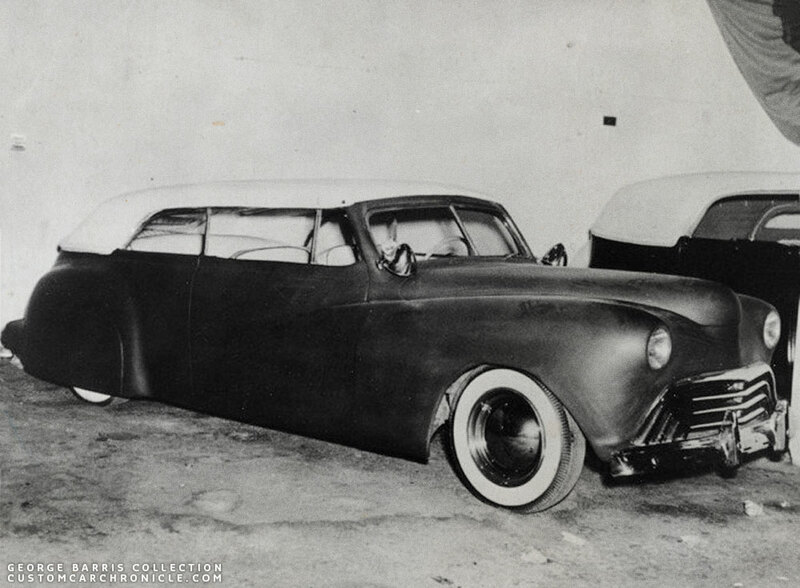 When Joe got the car back home he started to show it at several shows and since the car was a little more than just 4 feet tall it was named the 4 Foot Kustom. The car was quite different from anything else around at the time. Especially the fact that it had such a long padded top made the car really unique and stand out from the rest. Joe enjoyed the car for some time, according the stories he used it quite frequently and in late 1952, early 1953 he took it back to the Barris Shop for a new paintjob. This time the car was painted in a deep metallic maroon. 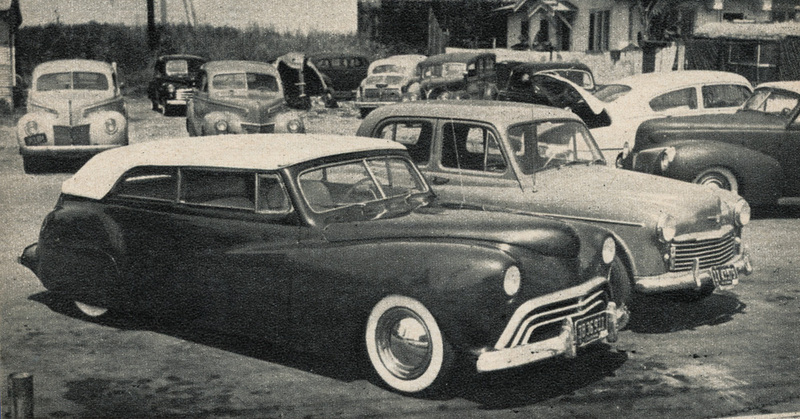 When the car was featured well over three years after it had been finished in the August 1953 issue of Rod & Custom the car had been repainted by Barris in a dark maroon. It also appears that the steering wheel and column have been changed, the door garnish moldings have been wood grained and a dash mounted rear view mirror has been added. The grille was updated by the removal of the bottom bar, and the center vertical bar was recessed so it was less obvious. It also appears that the front bumper was mounted higher on the brackets., most likely to make the front end a little less heavy. Most interesting is that all the article photos were taken at the D&B Auto Sales lost on Santa Monica Blvd in Hollywood. For Sale at the D&B Auto Sales on Santa Monica Blvd. in Holliwood. 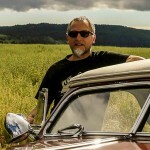 The lost was specialized in second hand Hot Rods and Custom Cars. Quite a few famous and not so famous Custom Cars ended up on this or similar lots at one point in their life. Side view photo from the R&C article shows the wonderful flowing lines of the extended from fenders and the molded in rear fenders. Front view shows how extensive the front end was reshaped to make all the components work together. The from gravel pan is, just as the one on the rear from a 1942-48 Ford, and molded into the front for the desired smooth look. Notice how thin the hood has become after the channeling of the body. 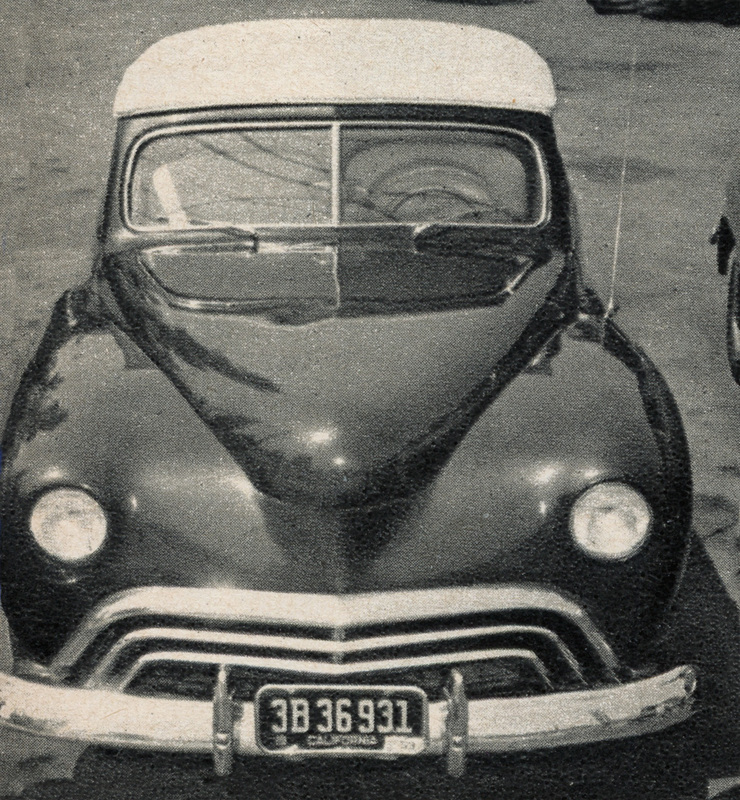 In the later version of the car the bottom grille bar has been removed to lighten up the front, and the center bar looks to be set back, to make it stand out less than on the stock Oldsmobile grille. The Rod & Custom article states the car’s height has been reduced to 49 inches, or slightly over 4 feet high. Hence the name 4-feet Kustom. 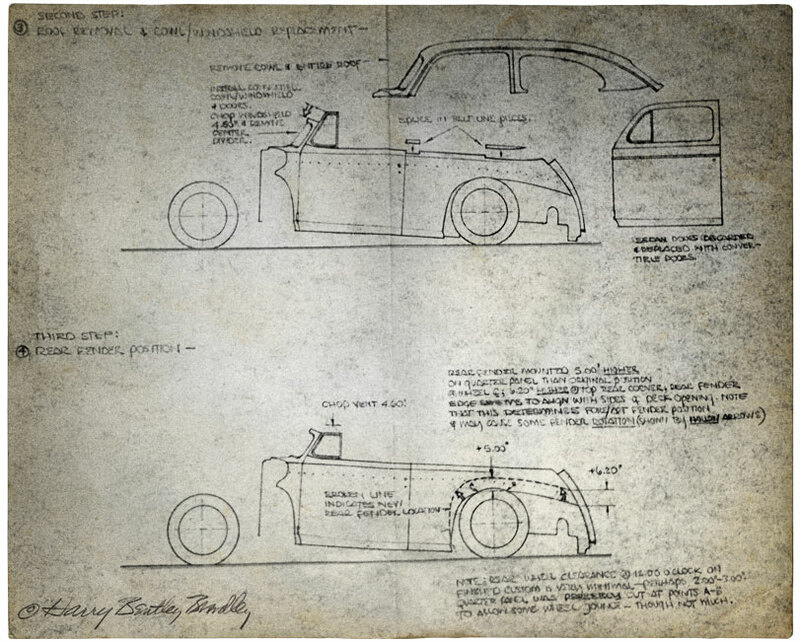 When Harry Bradley reconstructed the car in his study about the original car and the design of his “Tribute” Ford in the early 1990’s he came to the conclusion the car must have been a bit taller, 54.20 inches. A stock 1941 Ford is listed as around 68 inches tall. The rear view photo shows the completely welded and smooth rear section of the car. Notice that the Kustoms Los Angeles plaques have been removed by now. The rear window flap has been installed again, and we can now see how small the rear window is. The car has literally every body panel modified in some way making it one of the most extensive restyled cars in the early years. The keen eye of Sam and his brother George made sure that everything worked together well on this car as we can see in this photo. But I guess by 1953, this type of custom was unfortunately a bit outdated. 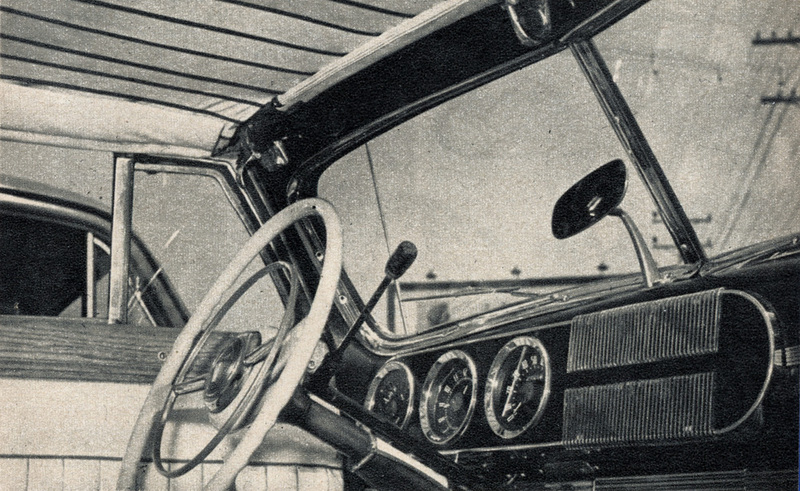 The interior photo from the R&C article shows the new steering wheel and column, dash mounted rear view mirror, and wood grained garnish moldings. It is unknown what exactly happened to the car after it was for sale on the D&B Auto Sale lot. At one point it has found a new owner, possibly more than one new owner, and suffered a hard life since then. Rod Powell mentioned that at one point he saw the car in very sad conditions at a used car lot / muffler shop in Freedom Ca. The car had been dismantled for mechanical work. Rod mentioned that he had heard that eventually the car was cut op, and its gone now. Such a sad end for such a great car. 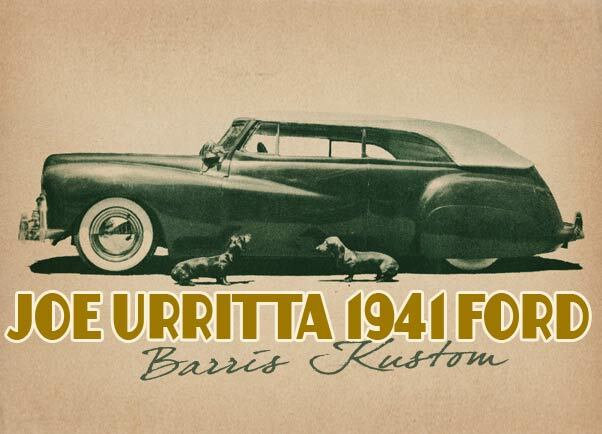 Harry Bradely has been fascinated with the Joe Urritta 1941 Ford since he saw it for the first time as a teen ager in 1951. In 1990 he set out to design a “Tribute” version of the car. 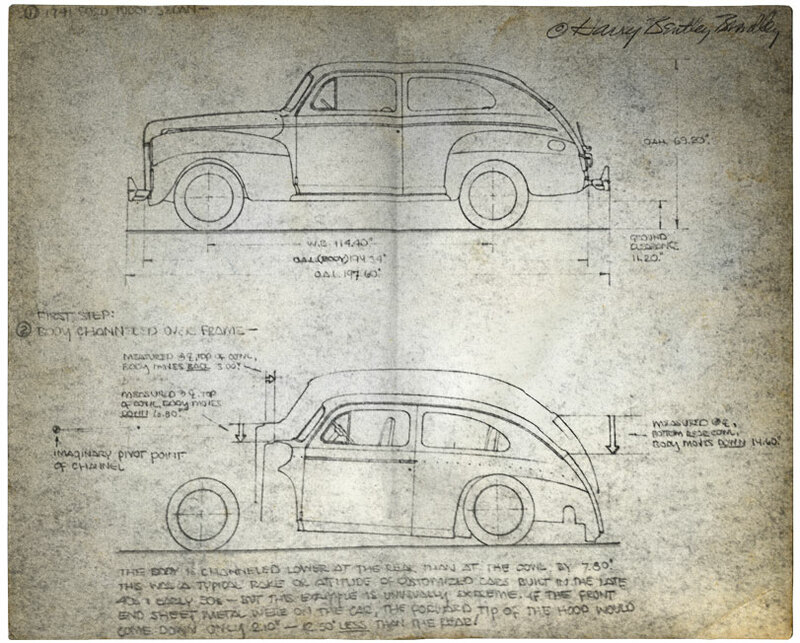 To fully understand the original custom he made 8 side view drawings, starting with an stock 1941 Ford sedan and ending with the side view of the Joe Urritta Ford. 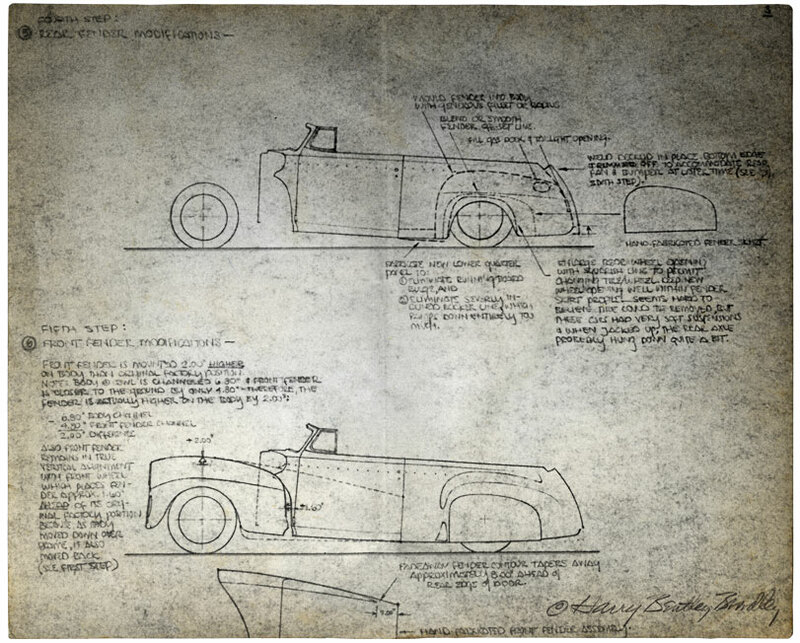 These step-by-step analysis drwawings give us a fantastic look what Sam Barris needed to do in 1949 to turn Joe’s Sedan into his sensational full Custom. 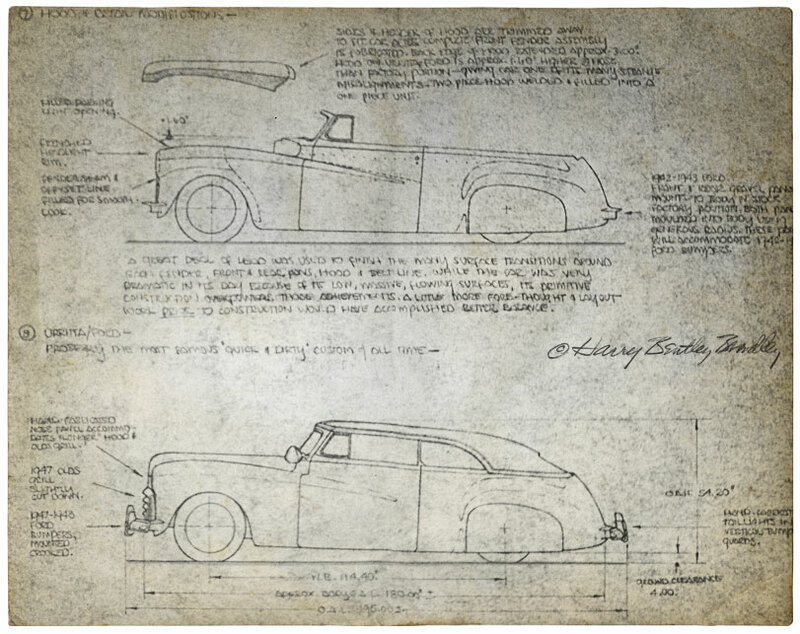 If you want to know more about the Tribute Ford Harry Bradley Designed, please check out the CCC-Forum Post I did about the booklet Harry Bradley created. And inspired version of the Tribute Ford was eventually created by Rod Powell and his team. Hopefully one day somebody will get inspired enough to recreate the Joe Urritta 1941 Ford, perhaps with a few improvements as a slightly raked windshield. 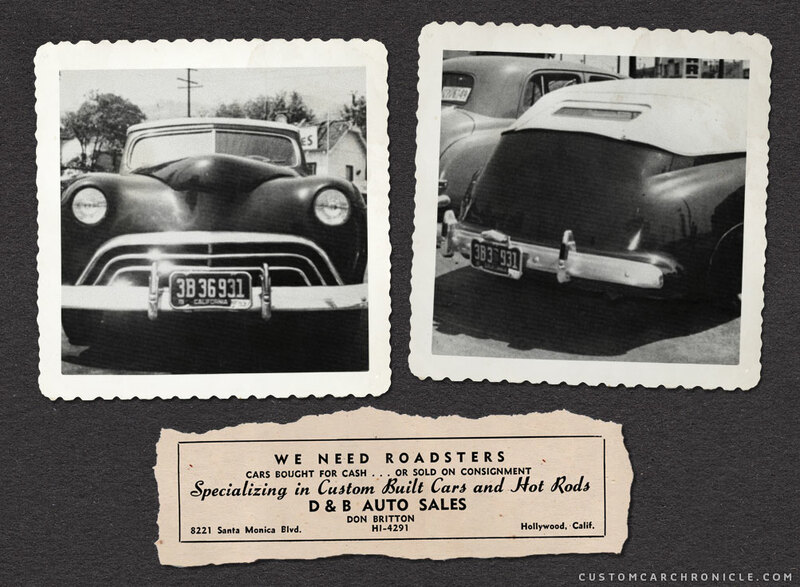 It would be great if we could see some more 1930’s and 1940’s sedan based customs. The Joe Urritta 1941 Ford once again proofs that the sedans make great Customs. Really like these articles ,the format is great with well researched in depth information & photos from various sources all put in the one place ,including some photos not seen before . Also the analysis of the style of the car ,what modifications were done & even some suggestions on improvements ! Hadn’t realised this car had the front bumper position changed ,interesting.